understand the issues and make quality repairs yourself, why not? maintenance, it is never suggested to give your system a full overhaul alone. and what went into it. could break down as soon as the next month of consistent use. and the rest will likely fall in line with a little intellect and knowhow. noticeable where you removed and did your digging. might be necessary to use it, but if you can avoid it with this solution, you’ll greatly appreciate it. but just remember that there’s a lot in the ground depending on your location. You also don’t want to hit gas, sewage, or anything really. It’s suggested to hand-dig around utilities, even when marked. Bore Rods For Obstructions – You’ll likely need this to get under the driveway or a sidewalk. Some plows have this attachment, so if you need to go under anything like that, make sure you’re getting this at the time of rental as well. Keep Clean Pipes – We aren’t talking about the outside. Use Duct tape on open ends to keep clogs from occurring. However, if you’ve already got dirt and debris in the lines, make sure you flush the system before installing the head. 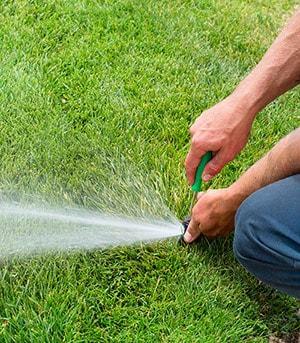 Use Pipe Cutters, Not Saws – A saw will create shavings that could break off into and clog sprinkler heads. Pipe cutters are generally inexpensive and will create a clean cut. Double-Clamp All of Your Main Lines – This will offer extra protection against leaks. Sometimes you can get an oval shape with crimp clamps, so this helps in areas that have this and are consistently pressurized. You can also stagger the ears of the two clamps in order to offset pipe distortions. Install Heads With Swing/Funny Pipe – This is a flexible pipe that would be installed between the poly pipe and the sprinkler head. This makes it easier to position the head more exact. It can also allow a little extra movement in cases where it gets run over. Rigid connections will be more susceptible to cracks. No Kinks – These become weak points in your pipe. Even if you straighten out the kink, it isn’t going to be as strong as it was prior to the kink. You’ll need to cut the section and splice the two ends together with a coupler. Use Self-Tapping Fittings – When you use a hand plow to pull pipe, it can be very difficult to install traditional tee fittings. You’re going to want to use self-tapping fittings to tap heads right into continuous runs of pipe. Snap it onto the pipe, and tap into the pipe with a spike that screws in. Hook up your funny pipe to the fitting and you’re all set. 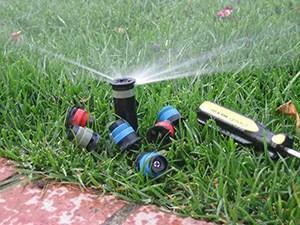 Use Smart Controllers – This can help save hundreds of gallons of water each day. There are controllers and sensors that take many things into consideration, including temperatures, sunlight, rainfall, etc. 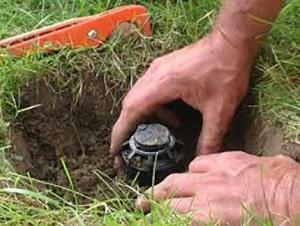 This will determine when and for how long your irrigation system needs to work. Some even connect to the internet, allowing remote access and updates straight from your mobile device. Protect Wiring – Correct enclosures go a long way to prevent unnecessary oxidation due to the elements.